A critical aspect of starting a new business is ensuring that you have sufficient money to trade. This could be to cover the initial startup costs e.g. purchasing equipment, and to cover ongoing costs e.g. staff wages and buying stock. A cash flow forecast is an essential part of the business plan for any new start company, it may be produced by your accountant with your input, or you may be able to produce it yourself. That forecast will predict the inflow and outflow of cash through the business. This should highlight the volume of startup funding that may be required in order to cover peak requirements. Prudent judgement suggests that you should ensure that you have some headroom in place to cope with unexpected cash flow troughs. If your business is going to be "self-funding" (income received will allow it to meet its liabilities) that is the ideal situation, but one that rarely occurs - most businesses either need cash to complete their setup or working capital to enable them to trade. The next best case is that you can inject your own money, without having to pay any fees. However, using your own money often means that you lose income from those funds e.g. interest or similar returns - and your capital is then at risk. 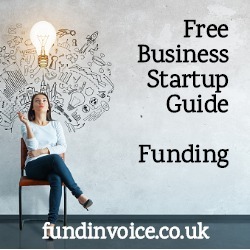 Our list of sources of business funding sets out all the possible options to fund a business, however many of those will not be available to a new start business, especially where there are no other assets available as security. I have also written previously about the difficulties new starts can have finding finance. Aside from equity investors (where you have to give up some ownership and control), and using your own money, or that of friends and family, receivables finance is one of the few options that can be freely offered to completely new startup companies. The reason for this is that it is secured against your book debts, the money owed to you by your customers. Therefore, the funder can take a more relaxed view. There are also a number of financial benefits from using factoring (this is receivables finance with a credit control service included in the price). One of the issues for new companies is that this type of funding is often not known by new businesses, as it does not have such a high profile as other forms of finance. If you have other assets available e.g, property, this does open up a few more options. There are lenders that will accept new startups providing there is some form of tangible security in the background. Micro company invoice finance options.